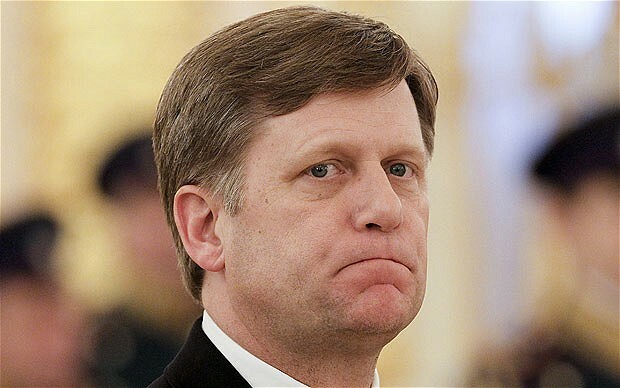 Michael McFaul, the US ambassador to Moscow and architect of Washington's "reset" in relations with the Kremlin, has accused journalists working for Russian state television of hacking his mobile telephone and email account. Mr McFaul, a former adviser on Russia to President Barack Obama, was confronted by reporters from the NTV channel as he arrived to meet a veteran human rights activist in the capital on Thursday. NTV is notorious for its Kremlin-linked smear campaigns against rights activists and Russia's opposition, which it accuses of receiving funding and "instructions" from the US State Department. Mr McFaul suggested the television reporters had found out his timetable of engagements using illegal means. "I respect press right to go anywhere & ask any question," he tweeted after the incident. "But do they have a right to read my email and listen to my phone?" He added: "When I asked these 'reporters' how they knew my schedule, I got no answer." The US ambassador was drawn into a bitter exchange with the journalists as he arrived for a meeting with Lev Ponomarev, one of Russia's most respected human rights campaigners. The reporters badgered him about what he was going to discuss with Mr Ponomarev, to which Mr McFaul replied in Russian. "All kinds of things." He added: "Please get used to it. This is completely normal. Your ambassador in our country goes around all the time without all this, without people disturbing his work. And you are always around me, at [my] home. Is this interesting? Aren't you ashamed? This is an insult to your country when you do this, do you understand?" Mr McFaul, who assumed his post in January, told the journalists he would happily give a sit-down interview if they contacted his press secretary. "But when you suddenly show up like this every time that I come here, as if this is a wild [savage] country: this is not normal. This doesn't happen in the United States, it doesn't happen in England, in Germany, in China – only here, and only with you." He said he doubted Vladimir Putin, the president-elect, would be forced to give an interview on a rainy street, without his coat. A video of the exchange was published on NTV's website. The ambassador later apologised for using the word "wild". "I mispoke [SIC] in bad Russian," he tweeted. "Did not mean to say 'wild country.' Meant to say NTV actions 'wild.' I greatly respect Russia." The channel denied wrongdoing, saying it had got information about the ambassador's schedule from "open sources" and its "wide network of informants".